Where can you get reed valves for lower cost, mass produced, imported air compressors? Or for that matter, if the replacement reed valve, also known as a flapper valve, from the OEM is priced prohibitively, what do you do? If it is not easy to find replacement reed valves or you don’t like the price, then your only choice is to make your own compressor reed valves. This page provides a couple of examples as to how you can make your own compressor reed valve with information provided primarily by folks like you that have successfully made their own. My sincere thanks to them! A broken or cracked compressor reed valve ensures that the compressor would not be able to build pressure satisfactorily. The compressor might just run and run and never build pressure past a certain pressure point, or the compressor might never build pressure at all depending on how damaged the pump reed valve was. Like almost any new project, the first time you make your own flapper or reed valve will take much longer than if you were making your own all the time. Making your own valve will require a bit of work. It helps if you are handy with tools and enjoy DIY crafts. Where is the compressor reed valve located on the compressor? 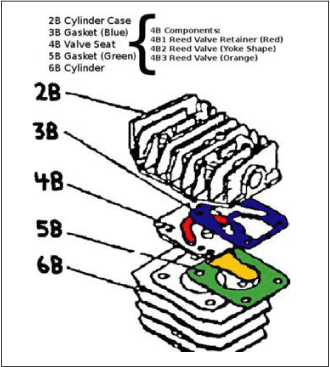 The image below identifies the pump parts common to many air compressors including where the typical reed valve is located. It is necessary to disassemble the compressor pump to find the valve plate or reed valve on a specific model of compressor. 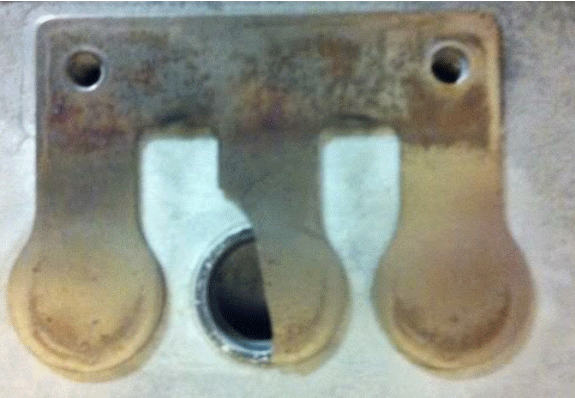 What might a broken compressor valve plate look like? When you tear down the pump you will likely find a thin sheet of metal with some type of fingers or flappers. It may look a bit like the following. 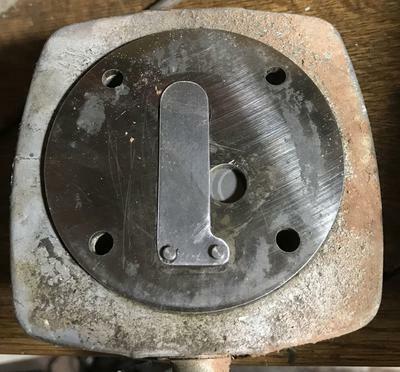 There are many shapes and sizes of reed valves and compressor valve plates, so don’t be concerned if one appears different than the one shown in the image. Actually, recently I’ve been provided another example of a broken reed valve, this one from a Kaeser compressor. Here you go. Do make sure that it’s the compressor reed valve that is broken, not the compressor valve plate itself. You can see that one of the fingers in the reed valves has broken off. This is not an unusual occurence due to the high heat inside the compressor pump, and the thousands and thousands if not millions of cycles the reed valves experience as they flap open and closed as the cylinder cycles. What material to use for a compressor valve plate? Some folks that use a decent quality paint scraper, one that has a large enough blade size, to cut the new valve plate from. The scraper blade is flexible and strong, designed for long term flexing. That it is metal will make it heat resistant. Another approach is to purchase high carbon spring steel shim stock. Get a supply that is as thick as the original valve plate. If you do a Google search using the phrase – high carbon steel shim stock – you will find a number of sources. Regardless of your choice in reed valve raw material, just make sure that the material you select is one that remains flexible over thousands and thousands of cycles and is heat resistant. Otherwise, you’ll be tearing your compressor pump down again and building a new valve plate for it sooner rather than later. Using the old valve plate as a template, mark the new material with the correct shape. Use a scroll-type hacksaw to cut out the valve plate shape from the new stock. To reduce vibration when cutting the thin spring steel, consider placing the shim stock on a thin sheet of wood first. This provides a base for the metal while you are cutting it, reducing vibration and noise as you cut the spring steel. Drill comparable sized holes in the new valve plate corresponding to those in the original plate. De-burr the new valve plate completely to ensure that it’s flat and no small spurs of metal prevent a tight fit over the ports in the valve pump. Does your compressor need new compressor pump gaskets? Odds are pretty good that in the disassembly of the pump a gasket may have been damaged if your pump has them. If you don’t use new gaskets when you reassemble the pump, it is quite likely that the compressor pump assembly will leak while in operation, and your air compressor will still not build pressure correctly. Replace all compressor pump gaskets. 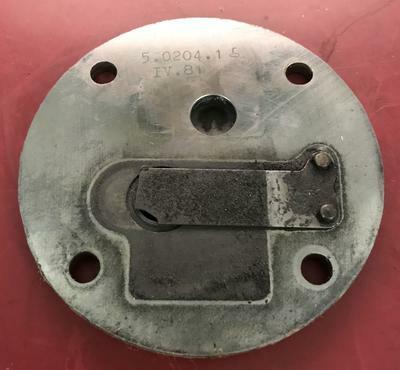 Since a valve plate was not easily available, forcing the custom manufacture of the valve plate, likely the gaskets for that same pump may not be available either. If a gasket kit for your compressor cannot be found, here’s how to make your own compressor gaskets. Reassemble the pump with new gaskets and your custom built reed valve plate, and your compressor and you are back in business. Got a question about how to Make Your Own Compressor Reed Valve?